Has the GPU tide finally turned in the gamers’ favor? Nvidia has just announced that GeForce cards are back in stock in a major way, at the manufacturer’s recommended price to boot. 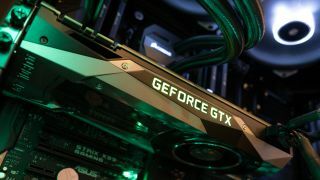 This is welcome news after months of graphics cards being thin on the ground thanks to demand from cryptocurrency miners, with sky-high prices for those GPUs which were on sale. The company sent out several tweets to let folks know about this (as spotted by VentureBeat), including one showing an empty shelf in a store being filled with GeForce graphics cards, and another depicting a huge cargo ship laden with containers of GPUs. Yep, that’s quite the supply run indeed. The graphics cards are available from various retailers in the US, and direct from Nvidia itself. For example, if you want a GeForce GTX 1070, you can bag one direct from the GPU manufacturer for $449; it’ll ship immediately, and there’s a limit of two per customer (as you can imagine). For the GTX 1080, you can order the Founders Edition for $549, although in this case it’ll take a week to ship, according to Nvidia’s website. The GTX 1060 (6GB) is $299 and again has a shipping time of one week. As mentioned, GeForce cards are also available at big retailers in the US, and to take Newegg as an example, various GTX 1070 models are pitched around $470, and the GTX 1080 at around $580. In the UK, you can get the GTX 1070 for £379 direct from Nvidia, although in this case, the limit is one card per customer. The GTX 1080 is available at £529 direct, although in the UK, the GTX 1060 is sadly still out of stock. Clearly, though, this is great news for those who are looking to upgrade their old graphics card, or to build a new gaming rig. But we’d swiftly add that you’d best move quickly to secure a GPU to be on the safe side, because as news of this spreads, cards may well start to shift quickly. There’s likely to be a lot of pent-up demand, obviously, given how things have been in the GPU market of late. A few months back, Nvidia did promise that it was “working really hard to get GPUs out into the marketplace for gamers”, and so it’s good to see the fruits of those labors. Whether the wider problems holding up GPU production – reportedly the difficulties in securing supplies of video RAM – have eased isn’t clear, but hopefully something has changed for the better in that respect, and this isn’t just a more temporary spike in supply. Of course, going forward, a lot will depend on just how popular the pursuit of cryptocurrency mining remains, although Nvidia is trying to address this market with new graphics cards designed specifically for miners. That said, how successful these GPUs are will depend on the price at which they’re pitched, obviously enough, but also other considerations – like the fact that they’ll have a weak resale value compared to consumer-targeted graphics cards (we discuss this in more depth here).